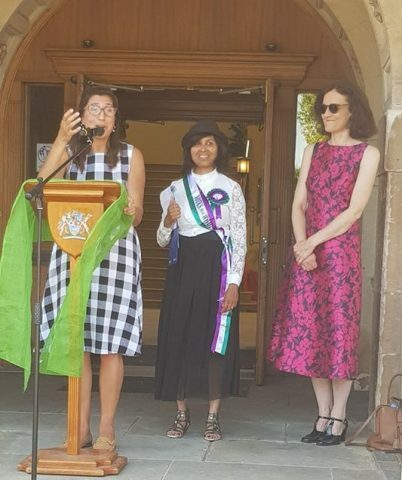 In the centenary year when women got the vote and on the birthday of Emmeline Pankhurst the Conservative Women’s Organisation hosted parties up and down the country to celebrate the contribution that Emmeline Pankhurst, and women like her had made to suffrage. The NW London CWO hosted a party where leading women from different walks of life were invited to speak. I spoke alongside inspirational women, Theresa Villiers MP, Cllr Alison Moore, Lieutenant Colonel Angela Richardson, Pauline Fynne and Jill Summers. In 2018 Emmeline Pankhurst’s birthday fell on World Cup Final day and Wimbledon final day. I spoke about how wonderful it was that the England men’s football team was finally equaling the women’s England football team by reaching the semi finals but that the men still had a long way to go in other sports such as the Ashes and World Cup Rugby to be equal with women. Unfortunately in other areas such as representation in Parliament, on Councils and on Trust Boards the number of women to men is not equal which is why I am a women’s activist. Women make up approximately 50% of the population so it is not unreasonable to expect equal numbers in policy making positions. I am the only woman on my Trust Board, Ashmole Academy Trust and I promise to remedy that over the next year. There are some excellent examples right here and now of women succeeding. Children, and having a family does not have to be a blocker. New Zealand’s Prime Minister, Jacinda Arden was pregnant whilst in office and had her baby whilst serving as Prime Minister. Benazir Bhutto, the first woman Prime Minister of Pakistan also had children whilst in office. They are an inspiration! Women are able to vote today because of Emmeline Pankhurst and women like her. I want to see more women in Parliament, more women on Councils, more women on Trust Boards and I will do that on my Trust Board! Let’s get equality and empower our daughters!